Off the Beaten Path: Oops! There Goes Another Rubber Tree Plant! He's got high apple pie, in the sky hopes! It's true that some hoping and wishing and thinking and planning...is just high apple pie, in the sky hoping. But I think that ant has more than unrealistic, silly scheming going for him. He has a God that created him to do a job--a mighty big and miraculous job, one that seems impossible for such a tiny guy--and a God who has enabled him to get that job done. We've all been amazed as we're walking down a sidewalk and suddenly we see a tiny ant carrying a huge potato chip, dead bug, berry or other morsel across the pavement on its wee little back. Obviously no one told that ant he couldn't do that. He's just doing what needs to be done and he's got the can-do attitude to get it accomplished. 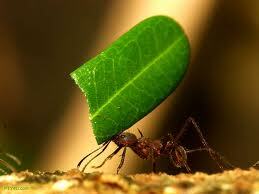 Now before I go too far with this ant analogy, let's bring this thing home via the scripture I read this morning. He was also able to perform. What had God promised Abraham? Of all things He'd promised this older gentleman a son, an heir. But Abraham was already quite old and his wife Sarah, who had yet to bear a single offspring, seemed to have a closed womb. Just like it seems virtually impossible for a tiny ant to move a leaf or a morsel of food across the pavement, it seemed highly unlikely that a child could ever materialize between this elderly couple. And yet, the scripture says that Abraham didn't waver at the promise of God through unbelief. Instead, as time went on and he and Sarah both got older and further from childbearing age, his faith actually got stronger. True, he tried to help God out a few times and found that he was getting in God's way more than he was moving things along. But by the time Isaac, that child of promise, arrived on the scene, Abraham's faith in God was so strong that he obediently took that son up a hill and laid him on an altar, knowing that the same God who had provided Isaac in Abraham and Sarah's old age could also raise him from the dead if need be. That's faith. Mighty big faith. Some might even call it high apple pie, in the sky faith. But when Abraham displayed that mighty big faith, well, mighty big things happened. God made big promises, Abraham believed and held onto his hope, and God came through in a big way. Let me ask you a question. Are you believing God for anything big right now? Of course, I hope you're believing Him for your salvation. That, after all, is the context for this scripture I pulled from Romans 4 -- that we are saved through our faith in God and not through works. So I do hope you are fully trusting God to save you and you're not trying to add anything to that perfect and complete salvation by working your way to the pearly gates. But beyond that, are you believing anything big from God? Do you have a huge need, a crisis of sorts, big dream? Have you talked with God about it? And have you listened for His response? I don't think we can just claim things willy nilly and believe that God will fulfill our every crazy wish. I believe in scriptural prayer of first abiding in God's Word and letting it abide in us so that we can ask whatever we feel led to ask based on what God is teaching and showing us. I do believe God answers those prayers based on His Word, His promises, His character. But the question remains, have you asked for anything big lately? Have you come across a rubber tree plant that needs to be moved? If so, are you staring at it with disbelief, woe, and confusion? Or have you asked God to move it, to help you move it? Folks, here's the thing. We need to have a big faith. We have a mighty big God and He is willing and able to move our rubber tree plants. But we need to ask. And we need to have faith. And we need "not waver at the promise of God through unbelief." But we need to be strengthened in our faith.